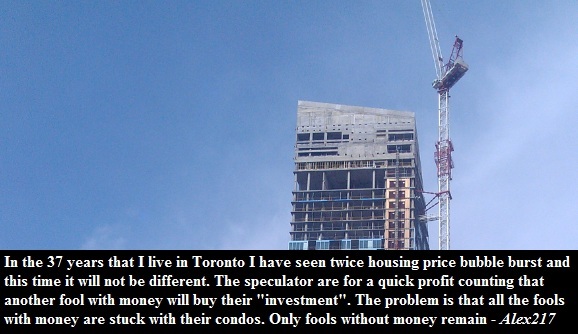 No, I am not talking about how overvalued condos are. That's nothing! The fallout from dropping prices is going to be microscopic compared to the hit that Toronto's construction industry will take. 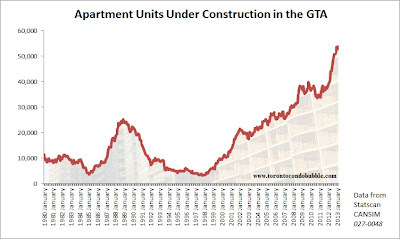 The real condo bubble is the construction bubble. As of February 2013, there are 51,738 apartment units being built in the GTA. That's an all time record! 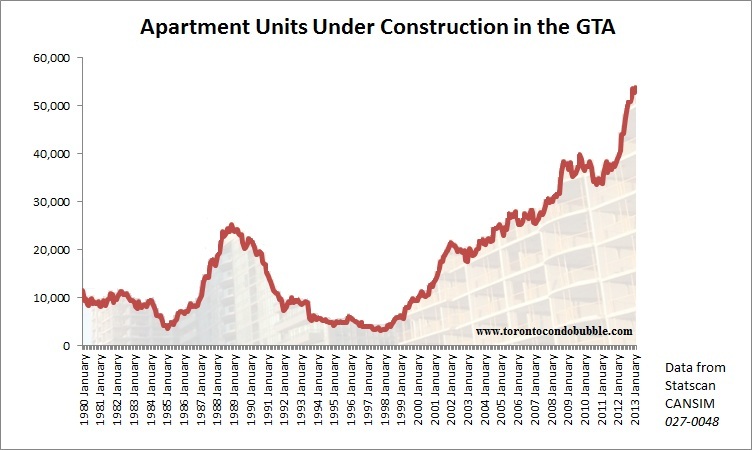 Of those units, 80% (or 41,136) are being built in the City of Toronto. Visually it appears as though the current construction bubble in Toronto is twice the size of the late '80s construction bubble. Keep in in mind that between the '80s and now, the population has grown substantially. More specifically, over the past 30 years the population in the City of Toronto went up by about 25% and doubled in the GTA. However, 80% of the new units are being built in the city. This is why I think that the present Toronto condo bubble is certainly larger than the one during '80s, even if you account for the population growth. Let me be clear: I am not saying that the prices will decline by as much as they did two decades ago. 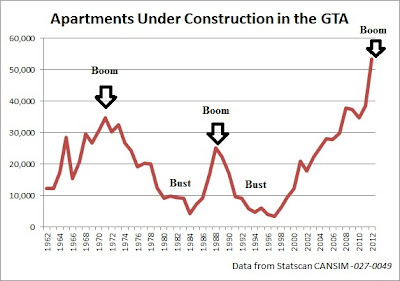 What I am saying is that the economic fall out in the construction industry will be as bad, if not worse, than it was during the aftermath of '80s housing bubble in Toronto. But, but.. Toronto is getting manhattanized! There is a large culture shift going on. You know - in ten years everyone will be raising their children in downtown shoe boxes. Look, construction is cyclical. There is a boom, and then there is a bust. Right now we are on top of the boom, next stop is the bust. Prepare yourself!